He wasn’t a show rat, being a Black Irish with a belly spot that ran everywhere. But it was soon evident he was a great pet, winning Best Pet two times. P.R. was also his job, converting many a rat hater into a believer of how wonderful they really are. I called him the official AFRMA spokes-rat and when Bobby-babies were offered for sale for the first time! . . . well, soon it was like a craze. 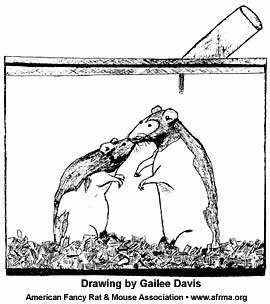 Even some mouse breeders were now raising rats. What a positive boost for rats and the club. He retired into a life of ease siring two more litters. Some of his descendants have followed in his pawprints taking Best Pet and now two of his Silver Lilac grand kids have gone to Sweden on an international exchange to carry on his legacy. When I decided to get a pet rat, I was selected by the runt of the litter. He was only half the size of his litter mates, but he was curious, outgoing, and very friendly. Since it was St. Patrick’s Day, I named this ruby-eyed, Beige Hooded baby Irish. As Irish grew, he appeared to reach normal size. This surprised me. He also appeared somewhat lonely. He enjoyed our time together but seemed to need something more. I decided to start a search for his lady fair. One day I found her. Creamora is almost identical to Irish in every way. A new and larger home was selected, and Irish was released at one end while Creamora was released at the other end. It was love (yes love) at first sight! They groomed, fed, played with, and chattered to each other. They were rarely more than four inches apart. When there was a little less than one week until their first litter was due to be born, I made a big mistake. I separated them. They both stopped eating and drinking. Both stayed huddled in one corner of their respective homes. Once in a while I would see them sniffing the air but then they would just curl up again. Neither would even take carrots, lettuce, nor broccoli. I was amazed at how quickly they were losing condition. By the second day of the separation the kittens were not yet born, and I decided that I had to reunite Irish and Creamora or lose them both. When I put them back together, they were thrilled. They rapidly groomed each other and drank together. They ate together and then quickly built a big nest. With all of this behind them, they curled up together. I vowed to never separate them again. That night Creamora went into labor. Irish used his front paws to massage her back. He gently groomed her head and softly chattered to her. As each kitten was born, Irish would retire to the far end of the aquarium until the new baby was greedily nursing. Then Irish would return to his loving duties. Finally Creamora had delivered the whole litter. She was ready to stretch, eat, and nap away from the nest. Irish greeted and groomed her. They chattered to each other and then Irish went to the nest. Irish sniffed and groomed each of his kittens and then he stretched out over the nest. He is as gentle and affectionate with his kittens as he is with Creamora. Both Irish and Creamora tend the kittens. Both wrestle and play with their young. They also seem happy to be alone again when their young are weaned. My original worry was that Creamora would always be pregnant, but she seems to pace herself. She is now expecting her next litter—it has been over three months. Scientists say that animals cannot feel love. If what Irish and Creamora display is not love, then I wish this lack of love for all of God’s creatures. 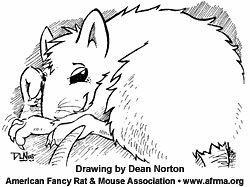 I thought I might take this opportunity to share with readers about how I became a rat fancier. I used to teach high school, and one year, my class gave me an Agouti rat as a gift (they knew I loved rodents). Ratt, as she became known, was without exception the smartest animal I’ve ever known. Brad (my husband) made a wooden top for a small aquarium, but the first day she tore at it so fiercely that we were afraid she’d seriously hurt herself, so we decided to forego the top and try her out without confinement. From that day, Ratt lived on the kitchen counter, retreating to her aquarium to dine or sleep — or to store what she’d snitched! Never in her two and a half years did she mess anywhere but in her cage. Ratt loved to peel the labels off Campbell’s soup cans. No other brand; just Campbells. When I’d come home from teaching, she’d race to the edge of the counter to see what I had in my arms. If it was school books, I’d get a friendly sniff. But if I had grocery bags, Ratt-a-tat would race back to her aquarium, stand on the top, and pull open the cupboard for me to load in the soup cans! It got so I’d just sigh and mark the can tops with the contents, because inside of ten minutes, Ratt would be proudly nested in the shredded labels, snoozing in her cupboard condo! One morning I awoke to find her on the floor. Somehow she’d fallen from the counter and sustained a compound fracture. I took the day off and called the local university vet, who specialized in rats. I felt he’d surely have to euthanize her, but he said, ‘Oh, no. She’s too fine a rat. We’ll set it!’ Once she was under, we carefully cleaned the bone ends and set them, stitching up the torn flesh. A match stick made a good splint and we wrapped plaster-soaked gauze around the foreleg. A bit more plaster, and she was set. When she awoke, she started to nibble at the plaster, but a paper collar soon stopped that. She despised that collar, so I told her if she wouldn’t chew on the cast, I’d leave it off. Would you believe she never touched it again. After ten days it was time to remove the cast. I lay Ratt in my lap and began to cut away at the tough plaster. Ratt reached up and took the scissors in her teeth, pushing them away. I looked down at her and said, ‘OK, if you can manage it, go ahead, be my guest.’ Like a buzz saw, she went down that cast and split it from shoulder to toe. The leg was wrinkled and hairless, but apart from a slight bend, it was as good as new. Ratt finally died of cancer, like so many of her kind. Brad tells me she used to lie on the counter all day waiting for me to come home, when she would climb my shoulder like always. One day he explained what I hadn’t seen: the painful way that effort required that she gathered her strength all day to greet me. We said goodbye that very afternoon. There’s never been another like Ratt. Say what you want about that dirty little creature with the buck teeth and ugly tail that runs around dumps and avocado orchards, and I’ll probably agree with you. But, domesticate him a number of years, breed him and change his color and you’ve got a brand new creature! Yes, ‘Rat people’ are a peculiar breed. We see beyond that nasty disease spreader to one of God’s most affectionate critters. When I was a principal of a small school, a little boy brought in two albino rats. ‘Daddy’ was quiet and very austere, and died in a very short time. A contributing factor may have been that ‘Mommy’ was a real extrovert with an insatiable curiosity and she was extremely intelligent. She could always find a way out of her cage and usually into the desk drawer where the teacher kept her snacks. One morning ‘Mommy’ was running in circles on the floor. We attributed it to a particularly crazy day. However, on close examination we found 9 ugly, pink babies, each about thumb-nail size. Within a few weeks they became 9 adorable little white balls of fur, and there was no trouble finding homes for each one—including my own! Then came the big moment! We took him to a showing of the American Fancy Rat and Mouse Association just to see the other critters. Well, it was obvious from the moment we walked in that we were not the only people that thought Mr. Rat was special! He was not only the biggest rat there, but also the most ‘laid back.’ We tried to introduce him to other rats, but he didn’t know that he was a rat. He backed away from them! We were persuaded to enter him in the ‘Best Pet’ class and—no question—he was the First Prize winner! And after all the pictures and the oohs and aahs, he really seemed to know he was special as he climbed around my shoulders and sniffed his ribbon. 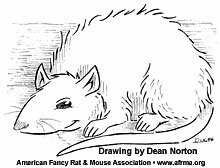 It wasn’t long after that, that Mr. Rat contacted the lung disease that plagues so many domesticated rats and, even though he went to two veterinarians and was on two antibiotics, there was nothing anyone could do and he died at age 2 years and 1 month. My husband and I had the two best dogs ever when we were growing up and my boys gave me a darling lop-eared rabbit for Mother’s Day which I love, but, without a doubt, I can safely say that ‘Mr. 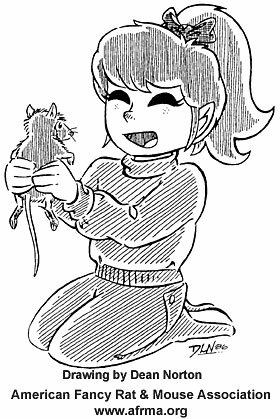 Rat’ was the BEST PET EVER!! All of the rats that work in the Education Department of the San Diego Humane Society are eventually named Willard by the school children that they visit, and Willie was no exception. He was a huge rat by any standard and was more than a handful to an adult, but to the young children he was an arm full. In the schools the children, in their innocence, are rarely frightened of rats. Willie, with his soft fur, his gentle dark eyes, and fawn color delighted them, bringing smiles to faces and teaching gentleness and respect for all animals. He seemed to know his job, sitting patiently in small laps with perhaps a twinkle in his eyes. Willie was different from his predecessors on this job, for he was not just ‘Willard,’ but was also dubbed ‘Willie, Willie, Lump Lump,’ which evolved into Willie. Willie visited mental facilities and convalescent homes as well as schools, and one gray haired lady, who...‘Never in her life imagined she’d hold a rat, let alone love it,...’ named him Willie Lump Lump with great tenderness. Willie gave the patients much joy and amazingly, it was perfectly obvious that the patients gave Willie much joy in return. We traveled in a small truck to the schools and other facilities with the team of animals (a chicken, guinea pigs, a lop rabbit, puppies and kittens) in the bed of the truck, and Willie would join us in the cab looking out of the window from his perch on the dash of our official looking vehicle. I must admit that to our fellow freeway travelers, eyeballing a rat was a very unnerving experience. Working one time with Willie while visiting a convalescent hospital where the director abhorred rats, but the patients loved Willie, the truck was loaded, goodbyes were said, when the director said, ‘Oh my Gosh, where is the rat, his cage is empty?’ Though it had been loaded in the truck the cage clearly did not hold Will. Dashing back into the cluster of elderly in the recreation room, the floor was searched, under wheelchairs, couches and then....catching our breath...we looked at the faces of the patients. One elderly, fragile woman had a giant ear to ear smile on her face and a large mobile lump under her sweater. Willie had been kidnapped! When he emerged you could believe Willie also had a smile on his face. At the county mental facility Willie had a real fan. A young adult male adored Willie, and when he said Will was one of the few creatures on the earth that understood him one could understand. He was wheelchair bound, very unhappy and not terribly attractive. He would beg us to leave Will for him to keep in his room. One day, when again we said no, he grabbed Will, stuffed him down his elasticized hospital pants and dared we female attendants to come get him! Ask no questions, but Will returned to the Humane Society. He was a rat of undetermined age when he arrived at the Humane Society as a donation, but clearly he was an adult rat. At the end of his second year of service he visited a very dismal county hospital where the patients were dressed as ghouls for a Halloween party. They had neuromuscular disorders and had become very overexcited by the party. Willie was passed, or grabbed, by one and all since he was such a favorite. One patient who no longer had control of his muscles, squeezed Willie so hard that his ratty waist shrunk to only inches, and his eyes bulged from his head. Willie controlled himself with nary a bite nor squeak. This visit was hard on him and he became very tired and developed an infection in his eye. It became crusty and bloody appearing, with the bloody tearing rats excrete, and it was agreed he was no longer a good rat representative. Willie retired to my home for his retirement years (months). He lived well, amongst my nunnery of rats, but he craved the human attention that he had become so used to. He would grab your hand and stroke his own chin with it which would endear him to even the most avowed rat hater. When given the chance, he would follow you about the house and sit on your feet begging to be picked up. He would cuddle in your arms like the softest pussycat that ever existed. Right before we left for a months holiday Will’s back legs started to drag and his eyes filmed a bit. 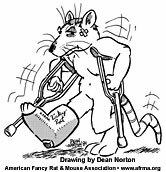 Who would care for an ill rat for a month...especially one who appeared to have limited days only? Of course, his pals at the Humane Society would look after him! He was placed in a place of honor on the Education Director’s desk and one and all came in with a tidbit or a rub to pay homage to him. He was given a new paper bag to sleep in each time his became soiled and amazingly, with all this tender care he lived until I returned. On Tuesday I told them I’d be down the next day to pick the old guy up and take him home. On Wednesday morning they reached in his paper bag to wake him up and Willie was cold, his paws folded under his head, his tail wrapped around his large, fawn, old body. We buried him under a sunny yellow honeysuckle tree.